She'll promote child welfare in Ghana, Malawi, Kenya and Egypt in October on her first extended solo international mission. 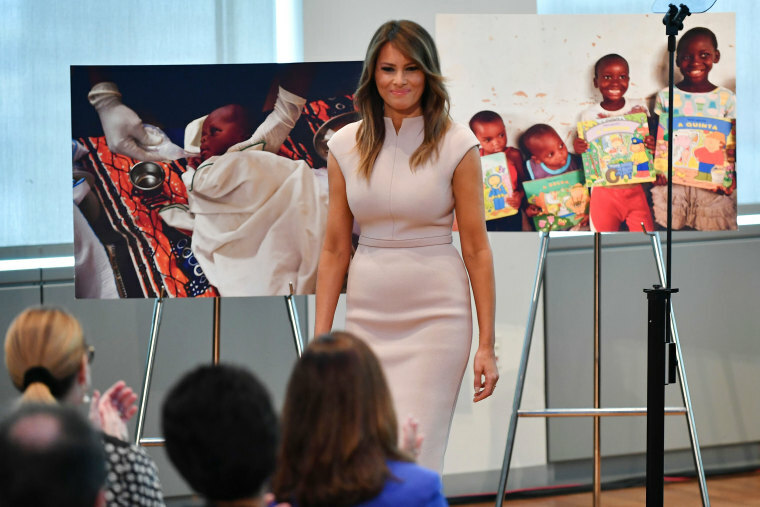 Melania Trump says she'll promote child welfare in Ghana, Malawi, Kenya and Egypt in October on her first extended solo international mission. She said she looks forward to spreading the message of her "Be Best" child-welfare initiative throughout Africa. She launched the campaign earlier this year to focus on overall child well-being, with an emphasis on opioid addiction and online behavior. Mrs. Trump will travel next month without President Donald Trump, who raised ire across Africa this year after his private complaint about the continent's "s-hole countries" was leaked to journalists. He said earlier Wednesday that he and his wife "love Africa." Trump later offered a partial denial in public but privately defended his remarks, The Associated Press reported in January. Trump also didn't deny the comment when he was asked about it while hosting Nigerian President Muhammadu Buhari at the White House in April. While the first lady tours the vast African continent, the president is expected to be in the midst of aggressive campaigning for November elections in which his Republican Party's control of both houses of Congress is at stake. The first lady's only other solo international foray was a September 2017 day trip to Toronto to join Britain's Prince Harry at an athletic competition he founded for wounded service members and veterans, a constituency both the president and Mrs. Trump say they value.